B cells are lymphocytes that play a large role in the humoral immune response as opposed to the cell-mediated immune response that is governed by T cells. The abbreviation "B" comes from bursa of Fabricius that is an organ in birds in which avian B cells mature. The principal function of B cells is to make antibodies against soluble antigens. B cells are an essential component of the adaptive immune system. 1. Brooks D.A., et al. (1981) Human lymphocyte markers defined by antibodies derived from somatic cell hybrids. A monoclonal antibody reacting specifically with a subpopulation of human B lymphocytes. J. Immunol. FMC7. Br. J. Haematol. 49: 137. 3. Zola H., et al. (1984) The human B cell lineage studied with monoclonal antibodies. In Leucocyte Typing Ed.A. Bernard, Springer Verlag. p363-371. 4. Zola H., et al. (1984) The antigen of mature human B cells detected by the monoclonal antibody FMC7; studies on the nature of the antigen and its expression. J. Immunol. 133: 321-326. 5. Bloem A.C., et al. (1988) Functional properties of human B cell populations defined by monoclonal antibodies HBA and FMC7. J. Immunol. 140: 768-773. 6. Zola H., et al. (1987) Markers of differentiated B cell leukemia: CD22 antibodies and FMC7 react with different molecules. Dis. Markers 5: 227. 7. Melo I.V., et al. (1988) The different diagnosis between chronic lymphocytic leukemia and other B-cell lymphoproliferative disorders: morphological and immunological studies. In: Chronic Lymphocytic Leukemia (eds. A. Polliack and D. Catovsky) p85. Harwood acad. Publ. London. 8. Ferro, L.M. and Zola H. (1990) Modulation of expression of the antigen identified by FMC7 upon human Blymphocyte activation: evidence for difference between activation in vivo and in vitro. Immunology. 69: 373-378. 9. Collins R.J., et al. (1992) Malignant lymphoma: reactive with the monoclonal antibody FMC7. Pathology 15: 350. 10. Serke, S. et al. 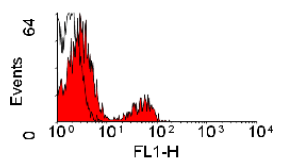 (2001) Monoclonal antibody FMC7 detects a conformational epitope on the CD20 molecule:Evidence from phenotyping after Rituxan therapy and transfectant cell analyses. Cytometry (Comm. 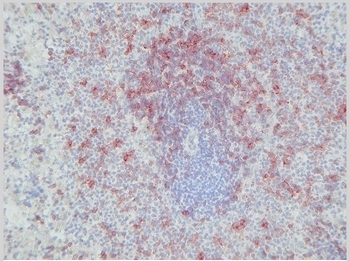 Immunohistochemical staining on rat spleen frozen sections using B Lymphocytes antibody clone Ki-B1R Cat.-No. BM4013. Staining of human peripheral blood lymphocytes with Mouse Anti Human B-Cells (FMC7): FITC (SM1303F).